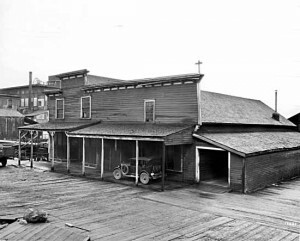 The store was the area’s first general store and later served as a post office, a library and a community center. 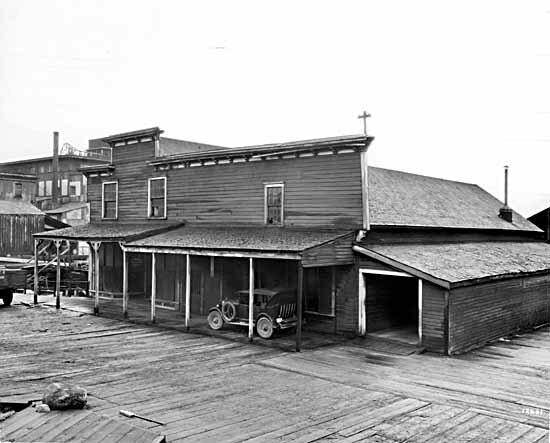 Early photos show it was built on stilts over the water, having a “boomtown” (wild-west style false front) and horizontal shiplap siding. The current vertical board-and-batten siding is a plausible restoration done sometime in the 1970’s. In 1929-30 the mill was demolished and the store was to be ceremonially burned down. However the store’s historical value did not go unnoticed and in 1930 it was rescued by the Native Daughters of B.C. and floated by barge to its current location at Pioneer Park in Kitsilano. It became the B.C. Historical Museum of Relics in 1932 and throughout the years has gained a collection of First Nations baskets and various items from Vancouver’s history.